Our objective is to properly match patients with a solution that will enhance their quality of life using today’s latest technology. RAM Orthotic and Prosthetic Lab is located in Schenectady, New York, with satellite clinic’s in Gloversville, Amsterdam, and Glens Falls. RAM serves patients throughout the Capital District with comprehensive orthotic and prosthetic services and solutions including fitting and manufacturing custom prostheses, braces, and orthotics for the knee, ankle, and foot. Our lead care provider, Rampersaud Jai Madho (Ram), CPO, is an American board-certified prosthetist/orthotist; he is highly trained and brings over 20 years of experience, so you can be assured that your patient will receive compassionate care in a supportive, knowledgeable environment. Following a comprehensive evaluation by our care team, we will respond to your office with our analysis and recommendations for your patient. Medicare has very specific requirements in order for orthotic and prosthetic claims to receive reimbursement. If your office does not have experience with referrals for such claims, please contact our office for detailed guidance on what documentation is required by Medicare. Level 1 – Household ambulator: Has the ability or potential to use a prosthesis for transfers/ambulation on level surfaces at fixed cadence. Level 2 – Limited community ambulator: Has the ability or potential for ambulation and to traverse low-level environmental barriers such as curbs, stairs, or uneven surfaces. Level 3 – Unlimited community ambulator: Has the ability or potential for ambulation with variable cadence, to traverse most environmental barriers, and may have vocational, therapeutic, or exercise activities that demand prosthetic utilization beyond simple locomotion. 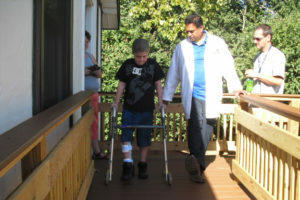 Level 4 – Child, active adult, or athlete: Has the ability or potential for prosthetic ambulation that exceeds basic ambulation skills, exhibiting high-impact, stress, or energy level.